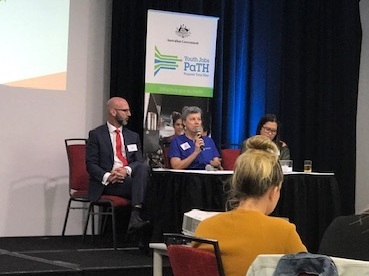 Represented by Human Resource Manager, Jan Dobbie, Varley Group took an inspirational interest in the NSW/ACT Youth Conference organized by the Australian Government’s Department of Jobs and Small Business Wednesday, 3rd April. As an invited guest, Jan took the opportunity to speak about key actions that Varley Group undertakes to assist young people make successful transitions from school to the adult world of employment. Varley Group prides itself as a company that effectively demonstrates a track record working with various youth careers programs like VET, Port Stephens P-Tech, PaTH, RDA Hunter STEMships and short training programs for unemployed people within the Hunter, Sydney and Ballarat areas. These programs have proven to be vital in the identifying passionate and committed young people for hiring as apprentices and trainees. Varley believes we all have responsibilities to showcase what our work is, what career opportunities are available within our organisation and industry. “Helping others ignite their passion and ultimately for making a society that provides economic and social benefit for all.’ States Jan Dobbie. The conference brought together stakeholders in supporting young unemployed people to identify how to improve the current support system. The event shared many inspirational stories and case studies combined with an open mind to structuring future service models in order to skill and prepare our youth for careers and work.